BETHPAGE, NY — A new one-stop shopping concept offering fresh convenience in food service, coffee, and fuel served by friendly people is coming to Nassau County. 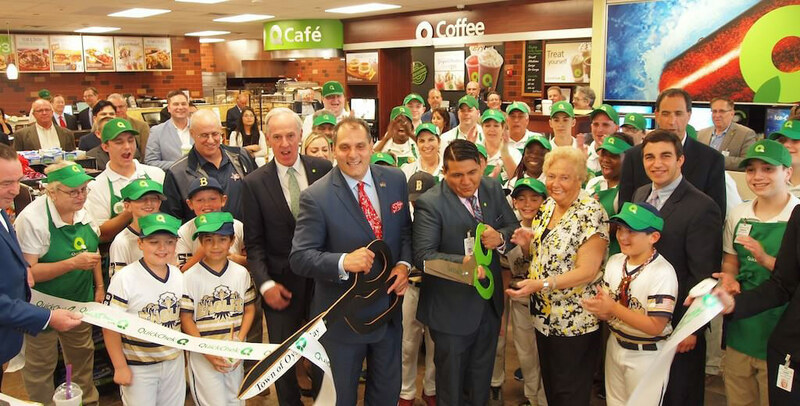 QuickChek, a leader in food services with an exceptional fresh coffee and handcrafted fresh food program that has been voted the best in America, is opening its newest store in Bethpage, its first-ever store in Nassau County and second on Long Island. The fresh convenience market chain will open a new 5,868–square-foot store at 3965 Hempstead Turnpike on Tuesday, May 2. QuickChek is known for being fresh and local, as well as for its coffee, which was voted best in America in a national consumer survey by Technomic in 2014. The new store will be open 24 hours a day and will feature touch screen technology enabling consumers to create delicious custom-made oven-toasted fresh subs, sandwiches, wraps and salads and personalized hot and cold beverages exactly as they want them, any time of day or night. Amenities include no-fee ATMs which provide additional added value to consumers; indoor seating for 13 people and outdoor seating for eight; six gasoline pumps offering 12 positions for high-quality fuel at value prices; and 39 parking spaces. Among the grand opening promotions will be free large hot coffee for patrons during the store’s first four weeks from May 2-May 28, 2017 and all 6-inch sub sandwiches will be just $3 through May 28. QuickChek’s starting pay has been above the New York and New Jersey state minimums for the past eight years. Long term career opportunities abound: all of the company’s district leaders and most of its vice presidents began their careers working in a local store. As part of its grand opening celebration in Bethpage, QuickChek will donate $0.25 for every sub, sandwich and wrap sold in the store from May 2-June 1, 2017 to the Bethpage Eagles Little League team. Grand Opening promotions include free large hot coffee and free 20-ounce iced coffee offered to all patrons and free 20-ounce fountain or QuickFreeze drinks from May 2-28, 2017.All 6-inch subs are $3 and all handcrafted smoothies and espresso drinks are $1.99 through May 28, 2017.